Caroline Irby – Over half of all the refugees who came to Europe during 2015 entered through the Greek island of Lesbos. I’m just back from photographing there for UNHCR, and am floored by how generously the islanders have responded to the crisis. Here is my current pin-up: Efi Latsoudi (left), psychologist and founder of PIKPA village, a former children’s holiday camp, disused over many years, which was transformed in 2012 into a refugee haven by Efi and other volunteers. It is community-run, providing safe accommodation for particularly vulnerable refugees, including women who have lost their children during the crossing; it is by far the most humane living environment I have ever seen for refugees, such a warm atmosphere. 30,000 refugees have been supported at this small camp since 2012, including Hind, from Syria, pictured here with Efi. I keep wondering how we in the UK would react at a community level if our country were on the front line of the refugee crisis. Efi Latsoudi is one of the joint 2016 winners of UNHCR’s Nansen Award for service to refugees, along with the equally brilliant Hellenic Rescue Team. Over half of all the refugees who came to Europe during 2015 entered through the Greek island of Lesbos. I’m just back from photographing there for UNHCR, and am floored by how generously the islanders have responded to the crisis. Here is my current pin-up: Efi Latsoudi (left), psychologist and founder of PIKPA village, a former children’s holiday camp, disused over many years, which was transformed in 2012 into a refugee haven by Efi and other volunteers. It is community-run, providing safe accommodation for particularly vulnerable refugees, including women who have lost their children during the crossing; it is by far the most humane living environment I have ever seen for refugees, such a warm atmosphere. 30,000 refugees have been supported at this small camp since 2012, including Hind, from Syria, pictured here with Efi. I keep wondering how we in the UK would react at a community level if our country were on the front line of the refugee crisis. Efi Latsoudi is one of the joint 2016 winners of UNHCR’s Nansen Award for service to refugees, along with the equally brilliant Hellenic Rescue Team. 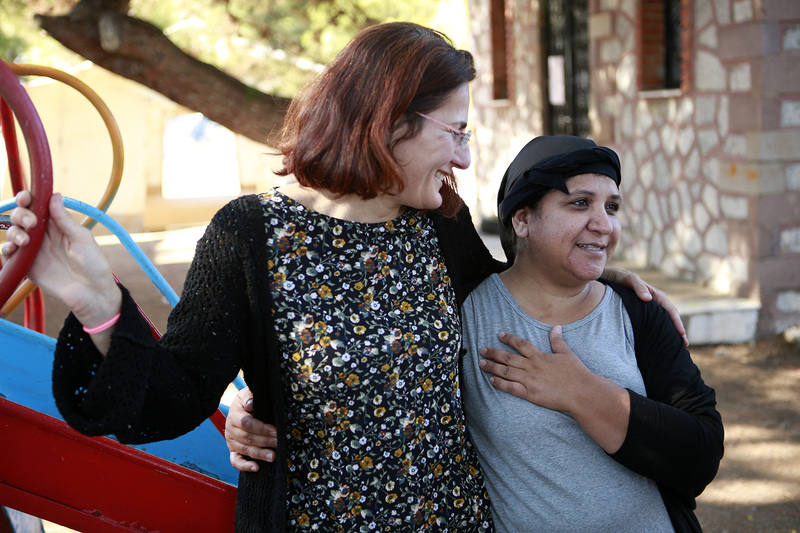 UNHCR Supporter Neshan with a Syrian refugee called Hind, who is 38 and has 7 children (3 in Greece and 4 with her husband who is already in Germany). PIKPA village provides safe accommodation and a welcoming environment for particularly vulnerable refugees, including women who have lost their children during the crossing, and adults and children with physical disabilities. PIKPA village is a former summer camp, transformed in 2012 into a refugee haven by volunteers with support from the local authorities. It is community-run, and Efi Latsoudi is one of the joint 2016 winners of UNHCR’s Nansen Refugee Award.